Last week I shared my favorite Matt Maher songs. These songs fill our days with lots of fun, second chances, peace, joy, and love. I enjoyed sharing those songs so much I thought I'd come back today and share my current favorite Audrey Assad songs. I don't remember how I was introduced to this incredibly talented artist, but I am forever grateful that I was. Her music wraps my heart with a peace that it yearns for in my silence, in my chores, in my moments of struggle, and in my moments of triumph. Her gift is oh so good! Gosh, this song just moves me! It brings me outside of myself when I need it! A gentle and good swift kick to my ego, pride, fears, anxieties, and more. It's beautiful and simple and lovely. This song is similar in tone and word and prayer to the first song but deserves it's own spot for it's prayerful goodness. When I listen to this song it helps me find the words. Lead me on, Lord is a prayer I always want to live and plead and what better way than to sing it ever so beautifully. This song was one of the first songs I heard of hers. I fell in love! We had some crazy ups and downs last year and this song always helped me remember truth. It helped me remember His goodness that is always present. I'm forever thankful for this song! In fact, anytime the boys hear this song come on...Mama, it's your favorite! St. Thomas, pray for me. Mary, Mother of the Eucharist, pray for me. Or something to that gist. So, this song. Yup. I heart it! You now those songs that put into words prayers that your heart has always tried to pray. That's what this song is. A prayer my heart heard, felt peace, and wanted to listen to/pray again and again. This one is new to me. I love it. It's Love. It's community. It's the Body. It's beautiful. Listen. There you have it y'all! These songs! Audrey Assad has blessed my feminine heart. Truly! They bring such beautiful prayer and peace time and time again and I pray they do the same for you! 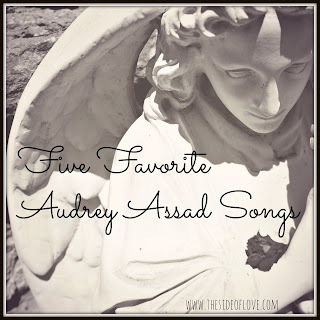 Do you have a favorite Audrey Assad song? If so, what is it? Also, have you heard of her new and amazing project? She'll be marrying our lovely hymns of old with her incredibly beautiful talent, and I couldn't be more excited! Linking up with the lovely Mary from Sometimes Mary, Always Martha for Five Favorites. Beautiful voice - love her! She has a beautiful voice! I've never really listened to her before... Thanks for this, Amanda!